7 Bedroom Detached House For Sale in Cranleigh for Asking Price £2,250,000. EQUESTRIAN - A charming Grade II listed country manor house, believed to date back to the 16th century and with later additions. It has very well proportioned rooms with good ceiling heights for a house of this age, the majority of which benefit from delightful southerly views over the gardens and beyond. The kitchen/breakfast room is a large bright space with a vaulted ceiling and an Aga. It has French doors to the garden, and is open plan to a family room. The drawing room and dining room are large rooms of great character, both with large open fireplaces. Upstairs there are five bedrooms on the first floor, three with ensuite bath/shower rooms and there is a family bathroom. The master bedroom suite has a vaulted ceiling and a large walk-in wardrobe. On the second floor there are two additional bedrooms, bringing the total to seven. In addition there is a beautiful detached period oak framed barn with a very substantial main barn space with a high vaulted ceiling and exposed oak beams. There are six additional, adjacent rooms within the main structure which would make a spectacular space for entertaining or a variety of alternative uses such as offices, secure storage or further accommodation, all subject to listed buildings consent. Central London - 39 miles. 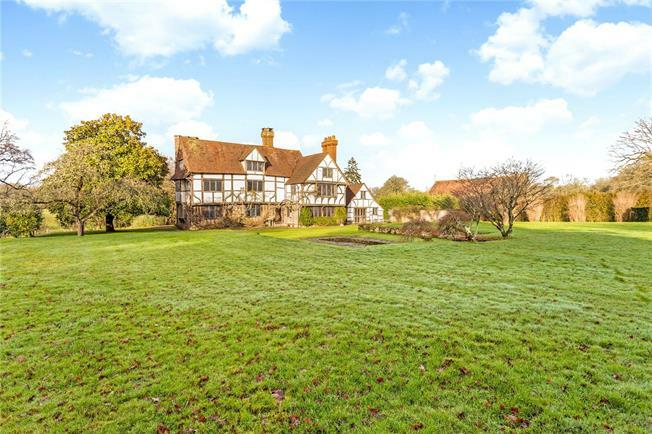 The property is located just to the south of the village of Ewhurst, at the foot of The Surrey Hills mid-way between Guildford and Horsham. The village has a shop, a Medieval church, a popular infants school and a traditional cricket green. It is convenient for the centre of the larger village of Cranleigh only 4 miles to the west, where there is a thriving High Street with supermarkets, a good selection of local retailers, coffee shops and boutiques, national chains such as M&S Food, Cook, Boots and Costa, restaurants, pubs and the Cranleigh Arts centre. The property is adjacent to the renowned Hurtwood Polo and Country Club, and in the heart of some of the county’s most beautiful protected countryside with miles of bridleways and paths for the walking, riding and cycling enthusiast. There is an excellent choice of schools in the area including Cranleigh School, Hurtwood House, Duke of Kent, Belmont, St Catherine’s in Bramley, and in Guildford, The Royal Grammar School for boys and Guildford High School for Girls. Communications in the area are excellent with commuter train services from Guildford station (Waterloo from about 35 minutes). The A3 is conveniently close, and connects with the M25 to provide access to central London, and both Heathrow and Gatwick airports. The house is accessed through sturdy iron gates and over a long tree-lined gravel driveway. Landscaped gardens with level lawns, formal borders and flower beds, specimen trees and shrubs surround the house and enhance this already very private setting. Within the immediate gardens there is a swimming pool and a sizeable greenhouse, both of which require renovation or replacement and there is a pond. Beyond the gardens lie three level post and rail fenced paddocks extending in total to approximately 18 acres. Beyond the barn, there is a stable yard with 10 loose boxes and tack rooms and extensive concrete hard standing. Both the barn and the stables can also be separately accessed from an alternative drive. In all there are about 29 acres. Services: Mains supply water and electricity, oil fired central heating, private drainage.